A good starting point for an initial ventilation plan is to do a “thrust per square foot” analysis for each floor of the facility. Based on the layout and any potential construction constraints, determine the fan model, how many, and where to place them. Then it’s onto sensors, detectors and controls. Once a design is drafted, a CFD analysis can confirm system performance and identify potential opportunities to enhance airflow and ventilation patterns by adding, subtracting, or relocating fans. The low-profile design of induction fans saves up to 8'' per floor of excavation and other construction costs over impulse fans and ducted systems. The number of induction fans required can be up to 70% fewer than the number of impulse fans required to do the same job, yielding considerable installation cost savings for induction fans. Ducted systems are also significantly more expensive to install than induction ventilation systems. Induction fans intake from below and exhaust at a downward angle, making them effective when mounted directly to the ceiling, within cross-beams, whereas impulse fans require more clear line-of-site for mounting, which means higher ceilings are required. Because of the back-pressure that builds in ducted systems, they require much larger supply and exhaust fans than induction ventilation systems. The following steps are sufficient to create an initial induction ventilation system design. A Computational Fluid Dynamics (CFD) analysis is often required to prove and further refine the design. Fans may need to be reoriented, added, or removed. An induction ventilation system can be tailored to suit virtually any garage. Before considering fan locations, the system layout needs to be identified. The Assess the best circulation pattern for the garage, and identify the supply and exhaust points. If possible, choose a design that complements the natural airflow. Airflow with broad circulation patterns that promote mixing will provide the most effective ventilation. Assisted Natural Flow In big, open garages—particularly where supply and exhaust outlets are a large distance apart—JetVent Fans can be used to reinforce the natural, directional airflow, boosting the volume of fresh air that ventilates the garage. JetVent fans can generate constant air movement in these garages to ensure that air moves evenly across the width of the garage. This assisted natural flow is a low-cost, effective way to eliminate air stagnation and remove the potential threat of unsafe levels of airborne pollutants. Linear Flow A linear flow system uses JetVent fans pointing in the same general direction to move air from one end of a garage to the other. This system is similar to a traditional, ducted system, however, the JetVent fans will direct airflow from a single supply point to a single exhaust point. For this plan to work effectively, the exhaust and supply points should be located on opposing ends of the garage across its longest dimensions. If this is not the case, units arranged for circular mixing may be a better solution. Linear Flow systems supply and exhaust points should be separated along the longest dimension of the garage. Determine Recommended Number of Newtons Assign 5 Newtons per 1,000 sq. ft. of garage floor. For multi-level structures, do this calculation independently for each level. Select Fan Model Vertical height restrictions may dictate which model to use. Check this first. If height restrictions do not drive fan selection, using fewer, higher-rated JetVent fans generally make the system more cost-effective than using more, lower-rated fans. However, to ventilate garages that are irregularly shaped, selecting more fans with smaller thrust ratings may be more effective. Determine the Maximum and Recommended Spacings between JetVent Fans for Different Levels of Fan Thrust These spacing distances are guidelines for fans placed in series. When the Recommended Fan Spacing is used, airspeed in most of the in most of the ventilated areas should be greater than 200 feet/min. CFD analysis will determine whether this is achieved in a particular garage design. Operating fans at Recommended Speed or below will ensure acceptable sound levels—see sound level data on Products page for additional information. CO Sensor A Carbon Monoxide sensor should be placed so no part of the garage is more than 50' from a sampling point. A 100' diameter circle around a CO sensor will show the coverage area, and typically equates to one CO sensor per fan. Additional CO sensors should be placed to provide additional coverage in areas where people congregate. NO2 Sensor NO2 sensors detect Nitrogen Dioxide (NO2). This gas is associated with diesel exhaust commonly found in transportation terminals, vehicle maintenance, and repair facilities. These sensors should be provided wherever a high level of diesel vehicle traffic is expected. Temperature Sensor Temperature sensors are used in areas where there are high relative temperatures and increased, local ventilation is desirable. Examples include byproduct heat from mechanical equipment, electronic/computer equipment, and areas that may otherwise stagnate and accumulate heat. JetVent Fans The JetVent Control System is an easily customized solution, designed to efficiently manage the garage ventilation equipment. It helps maintain good air quality when garage traffic is high and conserve energy when it is low. The JetVent Control Center works in conjunction with the optional CO and NO2 sensors, supply and exhaust fans. JetVent Controls can operate independently and can be monitored by a Building Automation System (BAS). 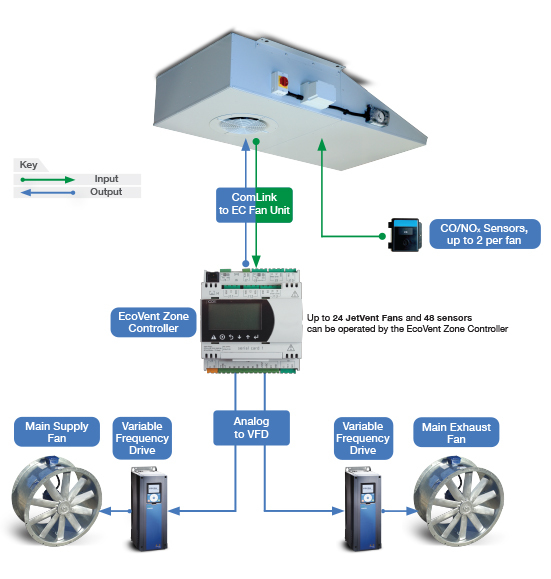 The JetVent Control Center helps increase the energy efficiency of a garage by providing localized, variable speed, demand-driven ventilation to maintain safe air quality. When the CO or NO2 pollutant levels within the garage reach a preset level, the ventilation fans increase speed. As pollutant levels increase and decrease, the speed of the fans and the associated rate of ventilation also increase and decrease accordingly. 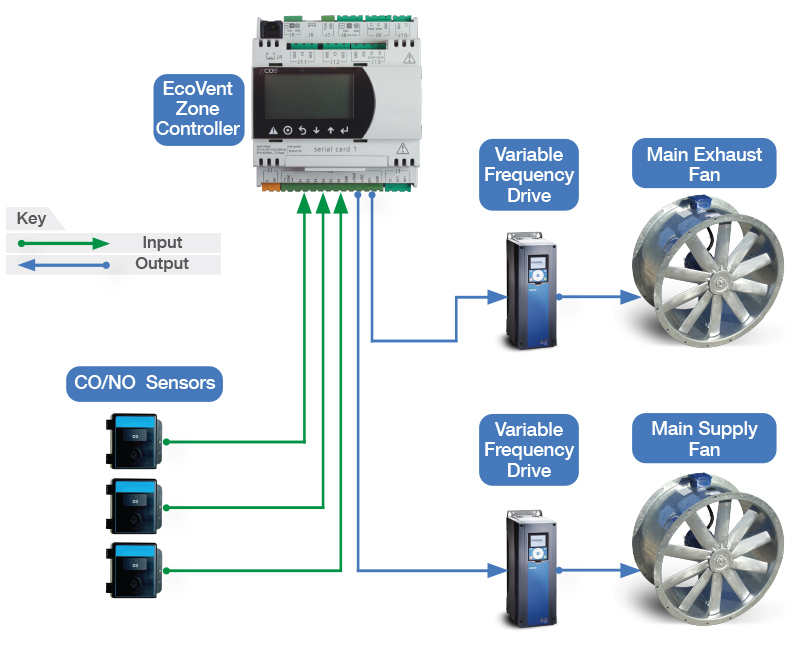 JetVent Fans EC motor’s integrated controller allows for either Analog or Digital inputs. Digital input allows two-way communication via MODBUS with the JetVent fans, sensors and detectors. 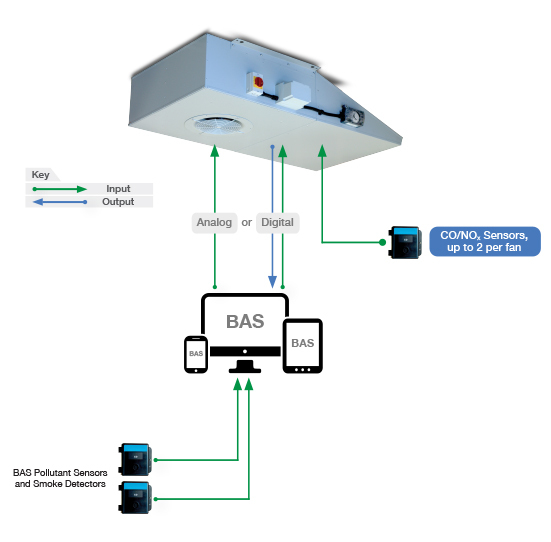 Other BAS communication protocols, such as BACnet, may also be supported with optional configuration. Fans can send fan speed, electrical status and error codes, and receive on/off/speed commands. JetVent Fans’ sensors and detectors can be monitored for ongoing safety levels. As described in Option 1, above, the JetVent Control Center offers attractive capabilities for integrated garage ventilation management. It can be used to enhance energy savings and operational efficiencies with traditional ducted systems. Please call us to discuss design details, and how the JetVent Control Center can help. JetVent Fans are typically hard-mounted to the concrete ceiling of the garage using 8mm fixing bolts. In some cases, fans may be set off the ceiling through the use of brackets and anti-vibration mounts. This may be the case if there are unavoidable obstructions near the discharge air stream. To maintain the building’s structural integrity, methods of affixing fans may need to be approved by a structural engineer. In general, vibration isolation is not required when installing JetVent Fans in retail or commercial office garages. However, anti-vibration mounts may be required for installations underneath residential buildings, or floor structures that are flexible or vibration sensitive. An isolation efficiency of 90%, or as otherwise specified by the design consultant, is recommended. For the purpose of estimating costs, the steps below may be bypassed. Allow 5N of thrust per 1000 sq ft of garage floor area to approximate the number of fans required. Fan Sizing and Placement Example: How fans are sized and placed based on garage floor area of 19,000 square feet. Fans should be placed as close to the center of traffic lanes as possible, with the air blowing along the lanes. This will ensure that the high air velocities close to the outlet nozzle do not significantly disturb pedestrian traffic because velocities will be lower at the lanes’ edges. Also, ensure that the throw pattern of the selected fan is long enough to reach the next induction fan. Minimum thrust criteria can be achieved with (4) JVEC-SP fans operating at the Recommended Speed of 28.4 N. Total fan thrust at Recommended Speed is (4) X 28.4 N = 113.6 N.
Fans are spaced within the Recommended Fan to Fan Spacing of 110'. Final fan to wall spacing under 150 ft maximum spacing guidelines for 28.4 N fan thrust. This is because the exhaust point is an area of low pressure, making it likely to enhance the throw of the fan. No part of the enclosure shall be greater than 50 feet from a sampling point. A 100-foot diameter circle around a CO sensor can show coverage areas. Additional detectors shall be installed in areas where people may congregate within the garage that are not within separately ventilated areas. The most practical mounting location for a CO sensor within a garage is the side of the support column away from traffic. CO sensors will be more effective if placed in areas where CO levels are likely to be high. For example, do not place sensors adjacent to the fresh air intake. 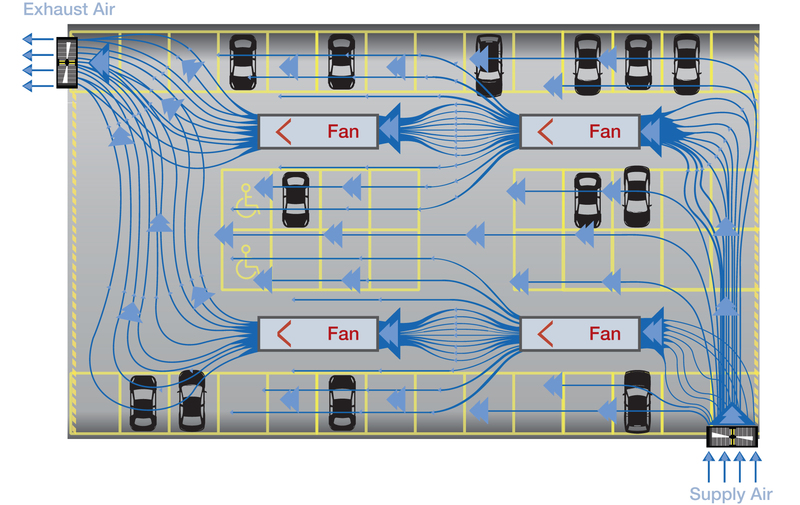 If JetVent fans are placed in each traffic lane of the garage, and Recommended Fan spacing is followed, the plan outlined above can be achieved by using one CO sensor per fan, and providing additional CO sensors at congregation points. Therefore, for this garage we would suggest installing 5 (4 + 1) CO sensors for good coverage. Airflow and running current for each fan should be checked to verify their performance in the field. The electrical current and fan pressures for all the main exhaust fans should be checked and noted. Main exhaust and supply fans should be commissioned for airflow as usual. Check individual CO/NO2 sensor operation using supplier’s recommendations. This may also include sensor calibration. Check CO/NO2 sensor naming/numbering in accordance with the control strategies. Use sensor’s integrated test mode to assist with commissioning. Overall system performance may be checked by using cold smoke. A cold smoke test is considered a practical way of representing the airflow in a fully enclosed garage. The main objective of the cold smoke test is to visually confirm good air distribution in the garage, and ensure that ‘dead spots’ are not present. Once the garage is open for use and sufficient vehicles are present, observe system operation to ensure it is operating as expected. Also, make sure that additional signage or other services have not been installed in such a way that they impede the air movement of the system. An automatic fire suppression system must be installed according to NFPA standards, and as required by code, to control the development and spread of fire. It is important that JetVent fans shut down by smoke detection prior to sprinkler activation. Careful placement of fans in relation to sprinkler heads is necessary to ensure their impact on sprinkler activation times is minimized. Fast response sprinklers may be an option to ensure activation times are minimized. In the event the smoke detection system fails, faster sprinkler activation times, with fans running, are desirable. Mechanical and architectural drawings in AutoCAD (.dwg) format that show the locations of any obstructions to airflow, such as support columns. These drawings must include plan views and elevations with detailed cross-sections that illustrate floor and ceiling heights. Exhaust and supply airflow rate calculations provided by the consulting engineer. Exhaust and supply air outlets/inlets clearly marked on the drawings with all relevant dimensions and details shown. Parameters for CO calculation are based on the International Mechanical Code Section 403.5 mechanical ventilation systems for public garages are not required to operate continuously where the system is arranged to operate automatically upon detection of a concentration of carbon monoxide of 25 ppm by approved detection devices. Additionally, the systems adhere to the Uniform Building Code Section 705. CO sensing devices will modulate the system to maintain a maximum average of CO of 50 ppm during any 8 hour period, with a maximum average concentration of not greater than 200 ppm for a period not exceeding one hour. The JetVent Fan model, quantity, locations, and method of control must be identified. Give us a call — we can help with this. Any additional views or plots required by the analysis are noted for inclusion in the CFD report. The final CFD report should include a detailed description of the ventilation system with placements of JetVent fans illustrated on the drawings. The design criteria and objectives of the analysis need to be clearly detailed at the beginning of the report. The report should also include the scenarios investigated along with air velocity and CO plots. These results closely predict actual airflow in the garage under various conditions. The cost of a CFD analysis can be a fraction of the potential savings associated with a JetVent Fans Induction Ventilation System. A JetVent Fans ventilation system can be designed for virtually any garage. Download the details to learn how JetVent’s advanced technology, digital controls, and integrated sensors deliver the ultimate in energy efficiency and safety.